The first visit for the 2012 DTM tour ourside of Germany, the field of Mercedes-Benz, Audi and BMW race cars roared around the British Brands Hatch road course. The third race on the calender, Gary Paffett enters his home country with a win and a second place finish in the early stage of the season. 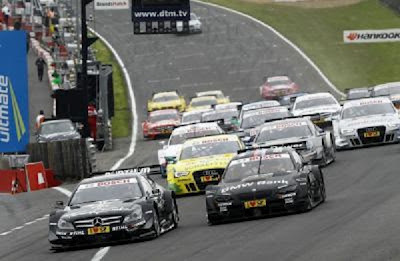 With the two earlier races won by Mercedes-Benz and BMW, the 1.929-kilomter Brands Hatch circuit would be an important barometer to establish the balance of the 2012 DTM schedule. On Saturday, Gary Paffett delighted the British crowd by placing his Thomas Sabo Mercedes AMG C-Coupe on the pole. Outpowering teammate Christian Vietoris by 0.144 seconds and BMW driver Bruno Spengler by 0.194 seconds, Paffett sights were set with a clear path for Sunday's 97-lap main event. Right from the start, Gary Paffett took advantage of his pole position to lead the opening lap of the Brands Hatch race. 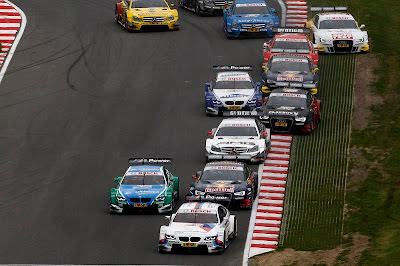 The front row starting car driven by Christian Vietoris lost race positions at the beginning of the Brands Hatch DTM event as Bruno Spengler was able to navigate his BMW M3 into the second place spot. 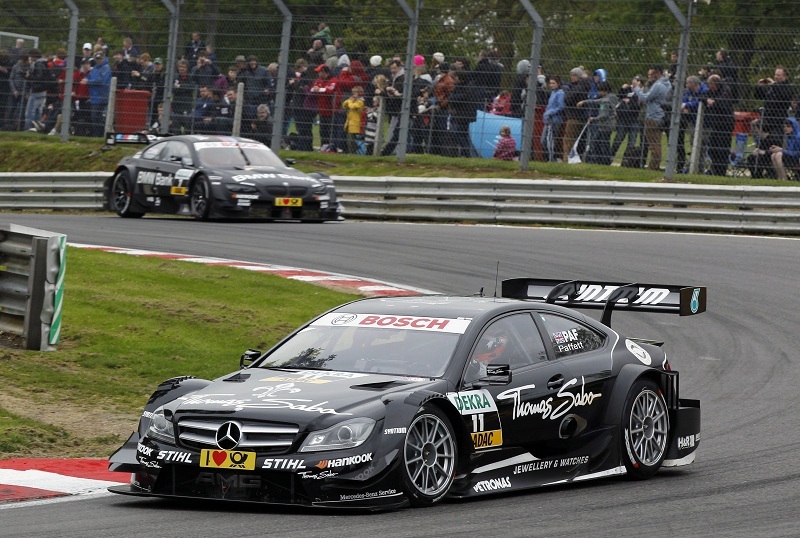 By lap 10, Paffett and his Mercedes AMG C-Coupe had a one-second lead on the Spengler. A racetrack cited as being difficult for passing, drivers at Brands Hatch were offered few opportunities to gain position on the race track. As the race progressed, DTM frontrunners such as Mercedes AMG's Jamie Green and Audi Sport's Mattias Ekström were playing catch-up throughout the 97-lap event. Ekström would finish fifth with his Red Bull Audi A5 while Jamie Green would come across the Brands Hatch start/finish line 8th. The BMW M3 of Andy Priaulx made an early exit from the race as a result of crash damage early in the event. The second major retirement of the Brands Hatch race was lined to the Audi A5 driven by Timo Scheider. Scheider would be forced out of the race on lap 55 due to an engine misfire after a difficult Sunday race for the German. Spengler's brush with some turn 1 curbing injured the front splitter of his BMW M3 race car. Into the late laps of the Brand Hatch race, Bruno Spengler's attention was devoted to his mirrors in efforts to hold off the Audi A5 of Mike Rockenfeller. Managing to hold off Rockenfeller's charge, Spengler crossed the line 5 seconds behind Gary Paffett who sailed to his second victory of 2012. “I am very happy with this second place. Gary Paffett was very quick, particularly in the first stint. Despite this, I was able to hang on to his coattails. It reminded me of my win at the Lausitzring, but with the roles reversed. It was a tough race." said Spengler in post race. 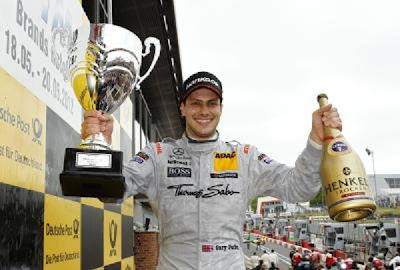 An error-free Brands Hatch event for Paffett, the Thomas Sabo Mercedes AMG C-Coupe driver explained that "it was a perfect race that we controlled from start to finish". With the early success for Gary Paffett, the British driver holds the overall points lead in DTM by 25 points. With Mercedes-Benz, BMW and Audi securing a podium spot for the first time in 2012 at Brands Hatch, Martin Tomczyk brought another BMW M3 home 4th ahead of Mattias Ekström. As one seasoned Canadian has earned a win and a runner-up position in the last two events on the DTM series, the 2012 DTM second driver from Canada had another learning experience with the stern Mercedes AMG C-Coupe. Robert Wickens finished 14th in the Brands Hatch race, you spot behind the BMW M3 of United States driver Joey Hand. "All in all, I'm happy with my third DTM race. My pace was quite decent and my stern AMG Mercedes C-Coupé ran very well. I'm getting better from race to race and gaining experience through working with the team.“ said Wickens continuing to learn the fendered race cars. The next race for the 2012 DTM series involves a trip to the Austrian Red Bull Ring on June 3rd.